Literally just sat down after opening and installing 12 GU10s from John …Literally just sat down after opening and installing 12 GU10s from John Lewis! Why did you wait until now, Amazon? WHY!? Buy from amazon. Return to John Lewis with receipt. £13.33 each. I don't think that's a bad deal. Literally just sat down after opening and installing 12 GU10s from John Lewis! Why did you wait until now, Amazon? WHY!? The hub sell the hub on for £25-30. Bought these but not very bright. Only 250 lumens. Colour hues much better. Around 750 lumens. Bought these but not very bright. Only 250 lumens. Colour hues much …Bought these but not very bright. Only 250 lumens. Colour hues much better. Around 750 lumens. So not much use for kitchen? And 3 for 2 on the GU10 colour ambience, so 3 for £100. Great offer.. I need 7 of them.. thanks OP. Are they good enough for toilets/bathrooms and bedrooms? Or still too dark? Could you paste a link for the page please? I've struggled to find this info for these and other bulbs. Could you paste a link for the page please? I've struggled to find this …Could you paste a link for the page please? I've struggled to find this info for these and other bulbs. Edit: that's a nice surprise the basic bulbs are 806 lumen! Thank you :)Edit: that's a nice surprise the basic bulbs are 806 lumen! 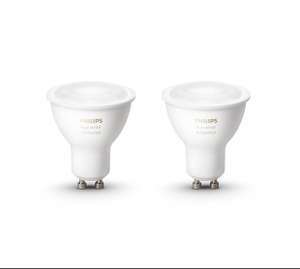 Most GU10 leds are around 200-400 lumens as you generally have more of those in a room outputting light rather than a single bulb, such as a B22 or E27 fitting, outputting a single light to fill the room. Is there an alexa compatible light switch? Would prefer to do that than use these. Is there an alexa compatible light switch? Would prefer to do that than …Is there an alexa compatible light switch? Would prefer to do that than use these. If I was to install a few white hue lights and 1 or 2 colour hue lights in 1 room (1 light switch controls several bulbs) would that work and I'd be able to change colour? Deal posting newbie! This is eden_s first deal post. Help out by leaving a posting tip or just to show your appreciation for their contribution.